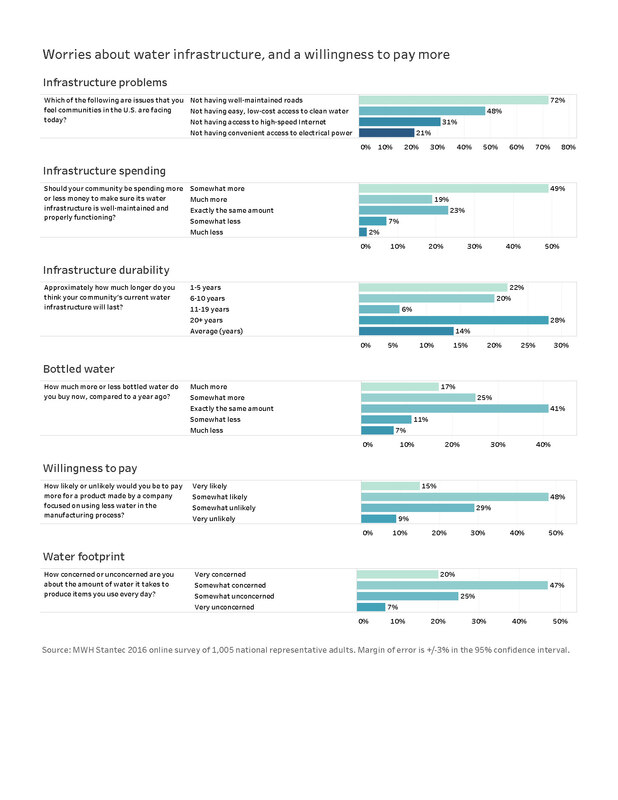 A majority of Americans worry about their water infrastructure and say they’re willing to pay more in order to upgrade water works, according to an MWH Global survey. The April 2016 online poll of 1,005 nationally representative U.S. adults also found that two-thirds of respondents were concerned about how much water it takes to make products such as food, clothing, and electronics. Below is a summary of the results, which are also on our data page. Compared to last year’s survey, there appears to be a higher level of concern and willingness to pay for upgrades. When asked about the life expectancy of their community’s water infrastructure, respondents estimated it would last an average of 14 more years. That’s down 2 years from last year’s results. Likewise, when asked if their community should be spending more on water infrastructure, 68% of those surveyed said yes. That’s up from 61% the year before. The survey also found that about two-thirds of people are concerned about how much water their consumption entails. When asked if they would prefer to buy products from companies that use less water in manufacturing, 62 percent of respondents said yes. On both of these questions, there were somewhat higher rates among millennials. Below are some graphics from the survey that summarize key points from the survey. The MWH Global water survey was conducted by Wakefield Research among 1,005 nationally representative U.S. adults ages 18+, between April 13 and April 19, 2016, using an email invitation and an online survey. Quotas have been set to ensure reliable and accurate representation of the U.S. adults ages 18+. Results of any sample are subject to sampling variation. The magnitude of the variation is measurable and is affected by the number of interviews and the level of the percentages expressing the results. For the interviews conducted in this particular study, the chances are 95 in 100 that a survey result does not vary, plus or minus, by more than 3.1 percentage points from the result that would be obtained if interviews had been conducted with all persons in the universe represented by the sample.